My mom has made this salad for our Christmas Eve dinner ever since I can remember! The first Christmas Mike and I had together I made it for the two of us, not a good idea. It makes a lot and it doesn't save longer than a day, but it was delicious! In a large salad bowl, place 3 cups lettuce. Sprinkle with sugar, salt and pepper. 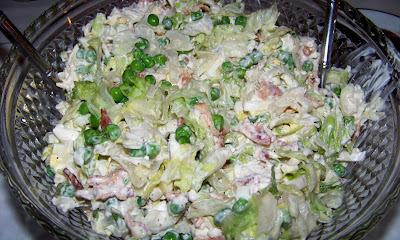 Layer in order the eggs, peas, bacon, remaining 3 cups lettuce, green onions and cheese. Combine mayonnaise and sour cream, spread over top of salad. Cover, refrigerate 24 hrs. Toss before serving. And before I made it Grandma always made it. I don't know where the recipe came from. Seriously, I think I might half it next year. It makes so much and really isn't great after the second day. Wow, I this looks yummy! We just went to a potluck at our church today and had to bring a side item. I really wished I had found your blog beforehand!!! I live in Tomball - so I'm not too far from you. Without giving out the name - Your girls don't go to a very popular pre-school in Copperfield, do they? All four of my kiddos have gone there and we love it! Your girls' names sound so familiar, which is why I asked. I'm glad you like the blog! My oldest goes to a small preschool in Katy, so it must be someone else :-)!